Working out should be a part of your every day life. It is a great way to lose weight and boost your self confidence. The main reason for this is when you sweat and are working out, endorphins are being released in the brain. These endorphins release feelings of happiness and of success. When you work out, it actually wakes you up and you will feel more inspired to get things done at work and have a much more productive day. However, many of us simply cannot find time to go to the gym. We have busy lives, and would much rather spend time at home with family than go out to the gym for an hour or two. Gym memberships also add up in price. But instead of going to the gym, why not bring the gym to you and fill your house with workout equipment? There are so many types of workout equipment available to you, and it will be a great motivator to still socialize at home while burning the calories. One of the best ways to enhance the muscles in your core and your legs is to do squats. You can simply just to squats without any equipment; however, in order to truly build muscle and strength you need a squat rack. These racks allow you to put more weight on you during a squat, and allow you to build the muscle you need to keep growing stronger and stronger. The very first thing you need to think about before purchasing a squat rack, or any gym equipment for that matter, is SAFETY. Safety is the most important thing when it comes to working out. You need to have the proper form, in order to not pull multiple muscles and you need to have the proper equipment. While really cheap equipment might seem ideal to you, what is not ideal is that equipment failing and dangerously hurting you or a loved one. This is why it is integral to purchase a squat rack with safety catches. Today we are going to be taking a look at three options when it comes to purchasing a squat rack with safety catches. Rather than just concentrate on one brand, we are going to be looking at three products from three different manufacturers. This is going to give you a wider selection to choose from. If you are on a budget or have money to spare, we have also included three products with a wide range of price. So even if you are on a tight budget, there is definitely something on this list for you! With all that being said, let’s dive in! 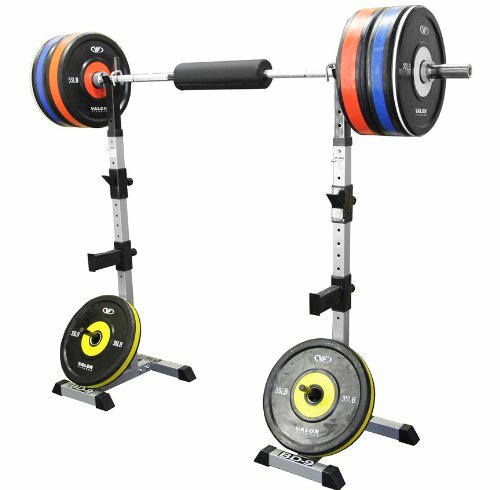 The first product up for review is the XMark Multi Press Squat Rack with Olympic Plate Weight Storage XM-7619. XMark is the manufacturer, and they are known to create highly durable products using the highest quality of steel. You want your squat rack to be durable enough to last a long time, so it is worth the initial cost at first. This is the most expensive squat rack on our list today, but is still competitively priced among the more high-end squat racks. This rack allows you to do workouts that include squats, bench presses, upright rows, lunges, raising of the calf muscles, and dead lifts. It is able to store Olympic level plates. There are two spotter hooks for extra safety that can be adjusted depending on your height. 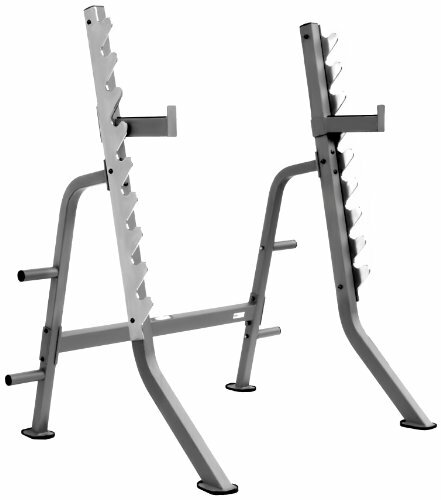 The chrome gun rack has nine positions to choose from, depending on the workout you’re doing and can hold up to 400 pounds. There are eleven gauges on this rack, with a 2inch by 3 inch steel mainframe construction. In order to ensure durability, it has a powder coat finish that is scratch resistant. 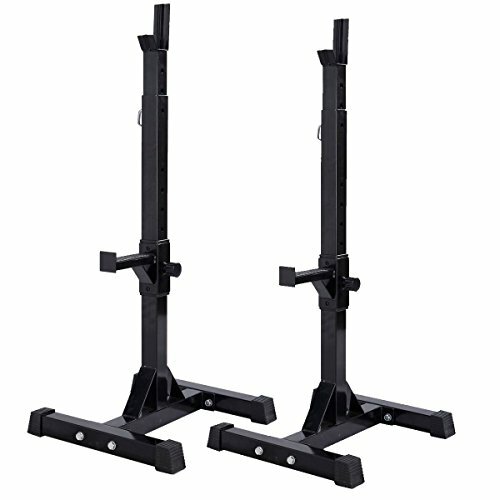 The second squat rack with safety catches is the Valor Fitness BD-9 Power Squat Stand. Valor Fitness is one of the most well-known brands on this list. They provide affordable workout machines that actually WORK. They are of high quality and are tested for both quality and quantity of weights. This squat stand is in the middle of affordability on the list. It features posts that measure 42.75 inches high. In order to catch the bar when the lifter is moving, there is a 5 inch back plate made of chrome. The base is able to be easily adjusted for someone who is larger, allowing it to be a lot more stable than many on the market today. It is recommended that you use this product for up to 500 pounds of weight. The final product up for review is the Muorka Pair of Adjustable Barbell Stands. These are the cheapest product on our list today, but that doesn’t mean it does not get the job done. These stands are made of carbon steel that ensures a lot of safety and can hold up to 390 pounds. There are safety spotters on each post, that can be adjusted, that ensures you are safe at all times. The frame is a H shape, ensuring that it is always balanced and very stable. The whole size of the unit measures 17 inches by 20.1 inches by 42 to 67 inches (L x W x H) and weighs 40 pounds. As we stated before, one of the most important things to look for in workout gear is safety. We can definitely say all three of the squat racks listed above have safety catches in place that are superb. Now it is up to you to find out what one is going to work the best for you!